It truly was a tale of two halves in the 59th meeting of these longtime rivals. Miami won the first half after a fumble by Clive Walford on the first drive and then scored on its next four drives. Similarly, after a fumble on its first drive of the second half, Florida State University scored on its final four drives. The Canes lost 30-26. FSU made its second-half come back. The Hurricanes struggled all game to get pressure on reigning Heisman-winning quarterback Jameis Winston, but were able to force turnovers in the first half to make up for it. When Winston had all day in the pocket in the second half, he was able to pick apart the Hurricanes defense and make plays. In the grand scheme of things, the game simply got away from Miami in the second half. The team’s game plan didn’t change much, but FSU had more bounces go their way. Miami couldn’t create turnovers after the first drive of the second half and was unable to wrap up on tackles. After the Canes defense forced three-and-outs on the first three drives of the game, it forced zero the rest of the game. Among other factors in the Hurricanes loss was the difference in special teams. Florida State has the best kicker in the nation, reigning Lou Groza Award winner Roberto Aguayo, who was three for three on field goals, including one from 53 yards. Hurricanes kicker Michael Badgley missed a field goal and had an extra point blocked, amounting to four wasted points, the same amount the Hurricanes lost by. There was no one reason the Hurricanes lost last night, except that Florida State has experience playing from behind and handled the situation perfectly. Miami’s offense outgained the Seminole’s (492-418) and dominated time of possession (35:37-24:23), but Florida State made plays when it needed to. 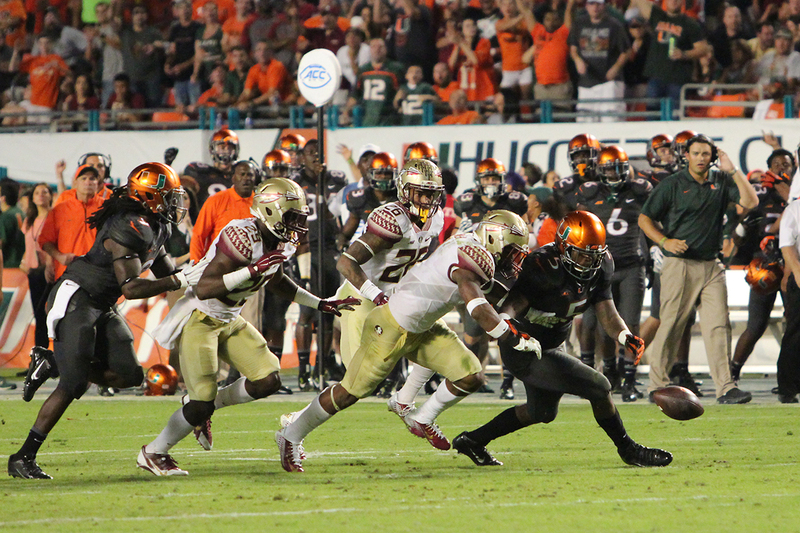 Junior running back Duke Johnson ran for over 100 yards for the sixth consecutive game. His 167 all-purpose yards made him the first Hurricane in history to accumulate over 5,000 for his career, but it wasn’t enough. Last season, Miami perhaps could excuse its loss because of Johnson’s ankle injury, but this year there’s no excuse. Miami had Florida State on the ropes and simply couldn’t prevent the Seminoles from clawing back. This loss will stay with the team and its faithful fans for a while. Perhaps it will ignite a fire within the team that will help the team win out this year despite being eliminated in the ACC Coastal. The Canes will travel to Charlottesville, Virginia and take on the Virginia Cavaliers 7 p.m. on Saturday.